Our Titan Telescoping Flagpoles are superior in quality to anything on the market today. They are proudly made in the USA and are made with only the finest materials inside and out. Each Telescoping Flagpole is backed with a Lifetime Warranty and withstands wind over 95 mph. Our poles have NO Ropes, NO Chains, NO Pulleys so you do not have to worry about knots and tangles. Also, this makes our flagpoles virtually NOISE FREE. Our Titan Telescoping Flagpole is made of sturdy aircraft grade 16 gauge aluminum with an hard coat anodized finish making this flagpole MAINTENANCE FREE, no need to worry about rust or painting. Our 20′ and 25′ flagpole come with an amazing 3″ base diameter which is 30% stronger than other telescoping flagpoles. 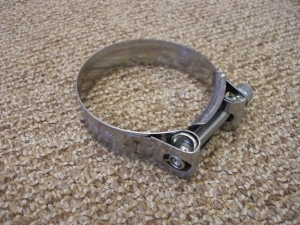 It also has 7 times the bearing surface which will reduce wobble in-between the sections. Each Flagpole comes complete with a 3″ gold ball, double flag harness, ground sleeve, premium 4’x6′ US Flag (3’x5′ on our 15′) instruction sheet and warranty card. 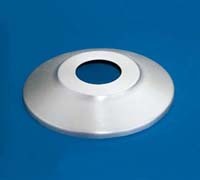 Stainless Steel Sleeve Clamp can be used to lock pole in ground to prevent theft. Respect our flag by illuminating it at night. Remember, lighting your flag at night is an important part of “Flag Etiquette”. 6) The Titan solar light has much brighter LED’s than other solar lights on the market. Our Side Mount is all alluminum, powder coated and designed for the Titan Telescoping Flagpole. Just mount to vertical surface for easy installation of your flagpole. Our aluminum dock mount is powder coated and allows you to mount the Titan Telescoping Flagpole to a flat surface. Bolt to dock or wood deck or set bolts on concrete for easy installation. The perfect way to finish off your Titan Telescoping Flagpole. Flash Collars are available in silver or bronze for a pefect match to your flagpole.